I made the mistake of going grocery shopping today. Emphasis on the word mistake. I should have known that it would be crazy since it's the weekend before Thanksgiving. To make matters worse the grocery store that I chose to shop at was out of everything and had the genius idea of stocking in the middle of a busy shopping day. Not the brightest idea. Add unpleasant shoppers and two screaming children and I think that I am staying inside my house the rest of the week. Don't get me wrong I love cooking and visiting family during the holidays. What I don't enjoy is the delightful attitude that people seem to acquire during this time of year. The worst seems to come out in particular at the sample stands, a little old lady literally pushed my oldest son out of the way in an attempt to get the last sample. Luckily the shopping part is over and now I can focus on the cooking, which I love. I am looking forward to Thanksgiving this year since my two boys will both be old enough to help me in the kitchen. I'm going to prep a lot of things the day before so I can just enjoy spending time with my children while they are still young enough to want to spend time with me. They are growing up way too fast and before I know it they will be all grown-up. So this year I am going to make sure to enjoy the little things and not stress out about everything being perfect. Cooking with my oldest isn't something that I do just during the holidays. Last week my son and I prepared a new recipe for Slow Cooker Ropa Vieja from the March issue of the Food Network Magazine, which with minimal prep is a great way to have kids help in the kitchen. This recipe has 11 ingredients. It takes 8 hours of cooking plus 15 minutes of prep and makes 4 servings. I had no problems finding any of the ingredients at my local grocery store. Obviously my six-year-old is too small to do most cutting, so he had the job of adding everything to the crockpot. I chose to leave all the seeds in the jalapeno, my two boys are currently in stages where they actually like spicy foods so I am enjoying it while it lasts. I am relatively picky about ketchup and will only use brands made with real sugar. The flavor is better and I try to not add a lot of high fructose corn syrup into my family's diet. I don't use flank steak frequently, but I did for this recipe. After making this dish I will definitely buy this cut again, it was so much more tender than the chuck roasts I have been buying. Instead of serving over white rice I served this dish over brown rice. As I have stated previously we rarely eat white rice and my two boys actually now prefer the taste of brown rice. I followed the remainder of the recipe as written. The flank steak in this recipe turned out delicious. This isn't a cut I normally purchase, but after this recipe I am hooked. It was so tender and much better than the chuck round roasts that most crockpot recipes rely upon. The unseeded jalapeno lent flavor, but wasn't too spicy for my two boys. Overall, a slow cooker recipe that my whole family enjoyed that was easy enough for my six-year-old to help me with. 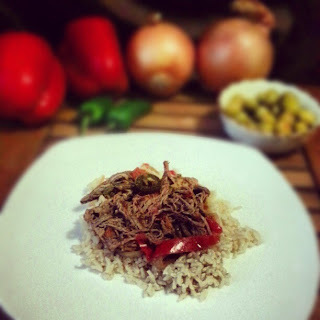 For the recipe go to Slow Cooker Ropa Vieja. BTW - I've just had about the same shopping experience you had. What are people thinking or are they? I was beginning to wonder if the store had shrunk but I think it was the re-stocking going on. Glad to be out of there. I'm glad that I'm not the only one that has had bad shopping experiences :) If you try the recipe tell me how it turns out!